Wow guys! My shopping desires have just shot through the roof! I've been particularly surprised at how much my Year of Thrift Challenge diminished my need to shop - for a while. I mentioned this in my most recent Window Shopping post, but I am realizing that fall is absolutely my favourite season when it comes to fashion! It's funny how paying attention to my consumption habits and reflexes can tell you a lot about yourself. Man, I would kill for the perfect knit cardigan (or just 'borrow' one from my mum who has impeccable cardigan/sweater taste), and I love all things furry and fuzzy and soft. I love denim jackets and neutral, earthy-tones. I love booties and being able to layer things without sweating enough to fill a modest backyard pool. I love scarves and the texture or colour or length they add to an outfit. I love my various jackets that pull together and outfit just so. I LOVE FALL FASHION! This week, I maaaybe bought another cardigan/sweater even though my sweater basket is already overflowing. It was absolutely perfect though! I found it at my current favourite thrift shop (for my fellow Torontonians: Kind Exchange at Yonge & Eglinton) and I will definitely take some photos with it and show it off soon! You know that feeling you get when you have an outfit on and you feel like your most powerful, fabulous, comfortable, YOU? That's how I feel with my fall wardrobe. That's how I feel with a killer pair of booties and a badass jacket on top of a cozy layered outfit. So back to the thrifting aspect of this. I actually find fall a great thrift season too. Thrift shops are stocked full of cozy sweaters and - let's face it, a cozy sweater is likely to look great no matter the fit, as opposed to a summer top that needs to fit you just so. It's easier for sure. 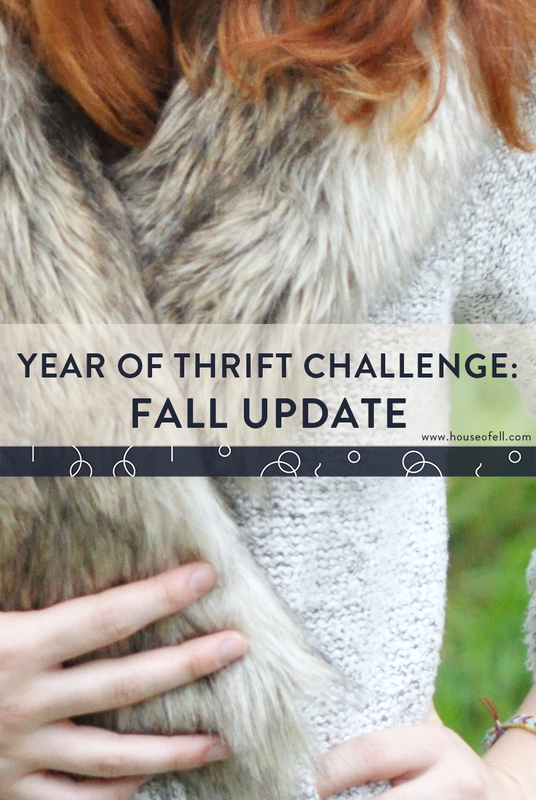 So I am about 3/4 of the way through my year of thrift challenge and I am still holding pretty strong. I have to admit with fall fashion coming out I've been feeling tempted to go into stores. I think I said the same about the emergence of summer patterns and florals and flowy pretty things, though! But I can resist. It helps that I already LOVE my fall wardrobe and don't really need to add anything to it right now. Do you have a favourite fashion season? For any new readers, check out my Year of Thrift Manifesto to learn more about my 2015 Year of Thrift challenge!